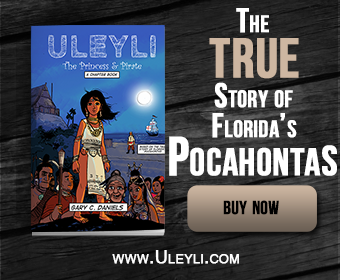 Editor’s Note: While writing my new book Uleyli- The Princess & Pirate: The True Story of Florida’s Pocahontas I did a lot of research about her origins. One question I always had was where did the name “Ulele” come from. In reading the original Spanish source materials I never found that name mentioned anywhere. This article finally solves the mystery. TAMPA — With a famous parade and marathon named for him — as well as art, music and film festivals — the pirate Jose Gaspar is Tampa’s premier mythological figure. He may soon have a partner. 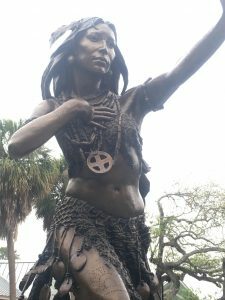 Ulele, reputed to be a Native American princess who lived in the 1500s, already is the name of a Gasparilla krewe — and spreading her fame soon will be a spring in Tampa Heights along the Riverwalk and a restaurant in the adjacent Tampa Water Works building. Volunteers planted the area with new landscaping Saturday morning in anticipation of a grand opening. As with the swashbuckling Gaspar, historians differ on how much of Ulele’s story is fact, how much is fiction and whether she existed at all…. ….Historian Tom Worth translated Spanish accounts of 16th century explorers and captives who visited Florida’s lower Gulf coast for his book “Discovering Florida,” to be released in September. Through these texts, Worth discovered that portions of the Ulele myth told today are simply wrong. For starters, he said, the name of the chief’s daughter is never mentioned in the original narratives. “Ulele” first appears in the 1859 book “Live Travels and Adventures of Ferdinand de Soto, Discoverer of the Mississippi,” by Lambert Wilmer. Worth said the author probably created a name of the previously unnamed woman as a storytelling device. According to the original texts, four women saved Ortiz, the chief’s wife and his three daughters. Then the chief put Ortiz to work as a slave. Later, the chief again decided Ortiz must die, so one of his daughters had her friend sneak him to a far-away village that was home to her love interest. Ortiz lived there many years until gold-hungry explorer Hernando de Soto passed through. Ortiz, schooled in Native American languages, joined de Soto as a translator. During their journey through the south, Ortiz told his story to members of the expedition. Some wrote it down. Ortiz died along the way.